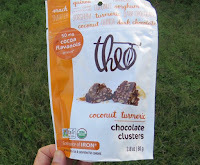 Today's crunchy Coconut Turmeric Chocolate Clusters were from Theo Chocolate (Seattle, WA). 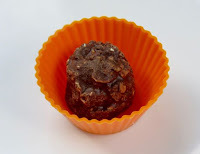 The crispy crunchy texture (similar to crisped rice, but with more heft) was provided by sorghum flakes and crisped quinoa, and provided a nice contrast with the chocolate. These "snack smarter" pieces were, refreshingly, not too sweet but long on well-balanced flavor. While a bit pricey, they'd make a great snack for a hike, bike, ride or lunch. 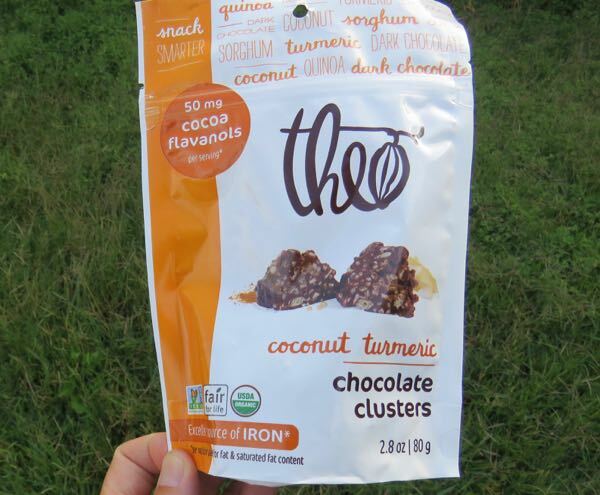 *Other Theo Chocolate snacking cluster flavors include Salted Almond and Lemon Hemp. ** Flavanols are phytonutrients found in cocoa beans and other plants. Each 5-piece serving (1/2 package) of this product "provides 50 mg of (cocoa) flavanols." ***Turmeric has been shown to have anti-inflammatory properties. And one of the benefits of dark chocolate containing flavanols may be to support healthy blood flow and circulation.